ORDER BEFORE 1:30PM FOR SAME DAY DELIVERY! 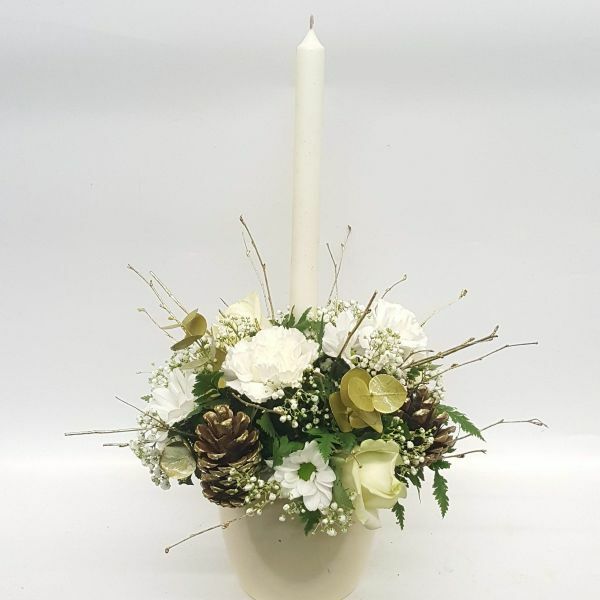 Harmony Candle Arrangement - a pretty ceramic container posy filled with seasonal flowers, finished with a slow burning taper candle to make the perfect slimline centrepiece. The joy of selecting an arrangement for your recipient is all of the flower arranging has been taken care of by our expert florists - all your recipient has to do is water and enjoy the display! Due to seasonal availability and supply factors, individual stems may vary. On occasion we may be required to make seasonal substitutions which we endeavour to do with flair and consideration to the original colour scheme, without compromise to the overall design of the arrangement. Sundries may vary to that shown. Bespoke floral arrangements and personalisations of orders are most welcome at Les Fleurs, please do call us on 01803 411963 and we will do all that we can to accommodate your requests. Why not spoil that somebody special with a delicious box of chocolates or a sweet little teddy bear. We also offer a range of balloons to celebrate a special milestone or offer a selection of vases should you wish to have one delivered alongside your order. We use only the freshest flowers and foliages when we hand-make your gift flower order. If your recipient is less than truly delighted with their gift, please let us know straight away and we will do our very best to put things right. Standard – The photo shown is an approximate example of the standard size. Where seasonal fluctuations allow, we aim to include more stems whenever possible. Deluxe – If you really wish to spoil someone special, upgrade to the medium size for a fuller display with more stems. Superior – Really send the ‘WOW’ factor with this impressive display of fresh flowers. Including significantly more stems and a dramatically superior display, your recipient will surely be delighted. Les Fleurs Florist is rated 5 out of 5 on Google out of 64 reviews.